In vertebrates, the inner ear develops from the otic placode, a group of cells found in a specific region on the surface of the growing embryo. Studies performed on various vertebrate species have demonstrated that when the placode is transplanted to other sites, it retains the capacity to develop into a normally organized inner ear. In collaboration with Dr. Karen Elliott of the University of Iowa, LMU’s Professor Hans Straka and his doctoral student Clayton Gordy have investigated how the afferent nerves that sprout from the ectopic ear reach the brain, and demonstrated the functionality of the connections they make in the brainstem. The new findings appear in the journal Developmental Neurobiology. The inner ear is not only essential for the sense of hearing, it also plays a crucial role in regulating balance and posture. Stimuli impinging on the inner ear are transmitted via nerve fibers that project to processing centers in the hindbrain. These fibers must therefore be capable of recognizing their target cells, and the appropriate navigational cues along the way. In order to investigate the pattern of functional connections made by nerve fibers that grew out of misplaced otic placodes, the authors worked with embryos of the clawed frog Xenopus laevis, an important model organism in developmental biology. They found that the ectopically located neurons grow along existing nerve tracts nearby. Thus when placodes were transplanted to the vicinity of the heart, the outgrowing nerve cells followed the course of the vagus nerve, which originates deep in the hindbrain and is responsible for controlling the heartbeat. When the placode was placed at a level midway along the dorsolateral flank, it gave rise to a complete inner ear. “In this case, the closest part of the central nervous system is the spinal cord,” says Straka. “The nerves first grow into the spinal cord and then the fibers ascend along it until they reach the hindbrain, ending in the region to which the fibers from the normal ears project. That means that the system knows into which region of the brain these nerve fibers need to grow.” Moreover, nerve fibers from the ectopic ear form the correct functional connections in the brainstem, and transmit nerve impulses via the relay stations with which the normal fibers make contact. The authors of the study tested this by stimulating the balance organ in the transplanted ear, and showed that this elicited the expected reflex movement of the eyes required to stabilize the gaze. In order to find their way to their destinations in the hindbrain, the ectopic neurons most probably rely on diffusible molecules, which are secreted by specific cells and form gradients that provide directional cues. Within the brain, other guidance mechanisms then come into play. These may be based on more specific molecular labels, or may depend on progressive, activity-dependent refinement of interactions to select the correct target. 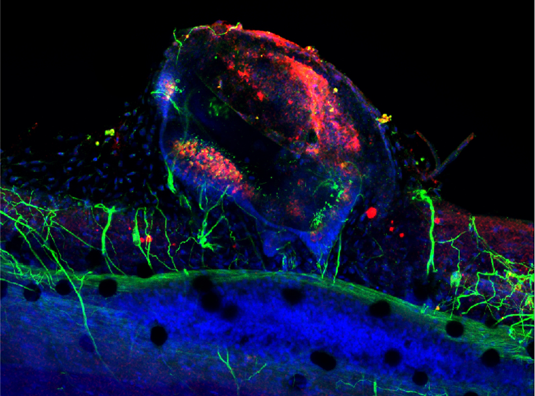 Straka and his colleagues would now like to learn more about the mechanisms that mediate the functional connections between sensory organs and the central nervous system. “A better understanding of these processes could play an important role in the design of more effective measures for the compensation of episodic loss of balance,” he says.